On January 1st, with all my Christmas knitting taken care of, and a stashdown of sorts begun for 2013, I decided that it was time to get back into some of the Sock Knitters Anonymous challenges. January’s challenge (Flora and Fauna) didn’t interest me at all; of course, now that I have seen some of the great patterns that came out of that challenge, I suspect I’ll feel differently next time. However, one of the featured designers, Caoua Coffee had some nice textured designs that I liked so this seemed like a good place to dive back in. Strangely enough, right around New Year’s, there was some talk in the KISS group about picking up gusset stitches and I mentioned that I hated it, and there was further discussion about the Criminally Mindless heel. I filed it away in the back of my mind, promising myself I’d look into it when I had a chance. I took a look at my wound yarn, and my indigodragonfly club yarn from last June (a lovely merino/silk/bamboo blend called “Bleats, Shoots and Leaves”) jumped out at me as a nice semi-solid that would work well. So off I went. The stitch pattern was nothing more than knits and purls, which frankly lulled me into a false sense of security and I made so many stupid mistakes. The yarn was yummy, but somewhat loosely spun. I think if I were to acquire another skein, I might use it for something like a shawl or scarf on slight larger needles to avoid splitting. That being said, it really did make the squooshiest socks. They feel just wonderful! The heel construction was an absolute joy to knit. Increases and short row decreases made for no gussets whatsoever. It looks a little different than I am used to, but at this point, I am willing to overlook that for the joy of no gusset stitches. The only think I can’t decide is whether the fit is right, but I think that’s because I knit my toe the slightest bit too short and the heel is being pulled down my foot ever so slightly. So that would definitely be a shortcoming on my part, pun entirely intended. I finished them on January 29th, which makes me very happy. I took a picture that night…which means they are a bit more Day-Glo in the picture than they are in real life (I so cannot wait until my balcony is accessible again! I miss being able to take nicely lit pictures!) In real life they are definitely more squash coloured, as the name suggests. Were There Changes Made To The Pattern? More like what did I keep?! 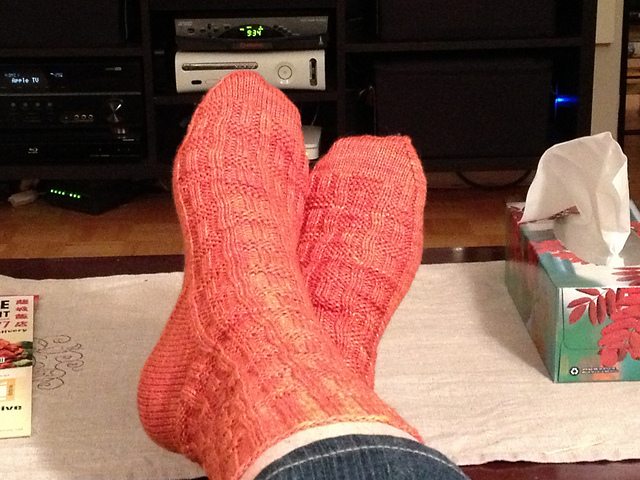 I kept the stitch pattern but reduced the cast on from 80 to 64 to fit my smaller foot. I substituted the Criminally Mindless heel. And didn’t even look at the toe in the pattern; I just did the standard grafted toe. Did I Learn Anything New? The Criminally Mindless heel construction. Would I Make Another? : No. They were fine to knit…but I made a lot of stupid mistakes because I stopped paying attention. For me “easy socks” means I don’t have to pay attention at all. These required just enough attention to be annoying.